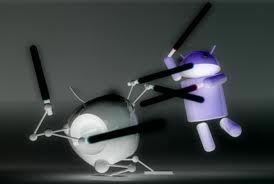 Apple was just handed potentially its biggest victory yet in its ongoing patent lawsuits with Google Android. The U.S. International Trade Commission (ITC) ruled today that Android devices that display phone numbers in a specific way should be banned for violating Apple’s patents. The ruling potentially bans phones like the HTC EVO 4G, Droid Incredible and T-Mobile G2, starting in the spring of 2012. The ruling effectively bans HTC from selling those devices beginning April 19, 2012, although units sold before then will be unaffected, and HTC will be able to import refurbished products in order to honor warranties on those phones until December 19, 2013. The ruling is a big symbolic victory for Apple, since it deals with how Android itself works, not actually software specific to HTC. It also theoretically gives Apple free reign to go after any Android manufacturer it cares to with the same patent.